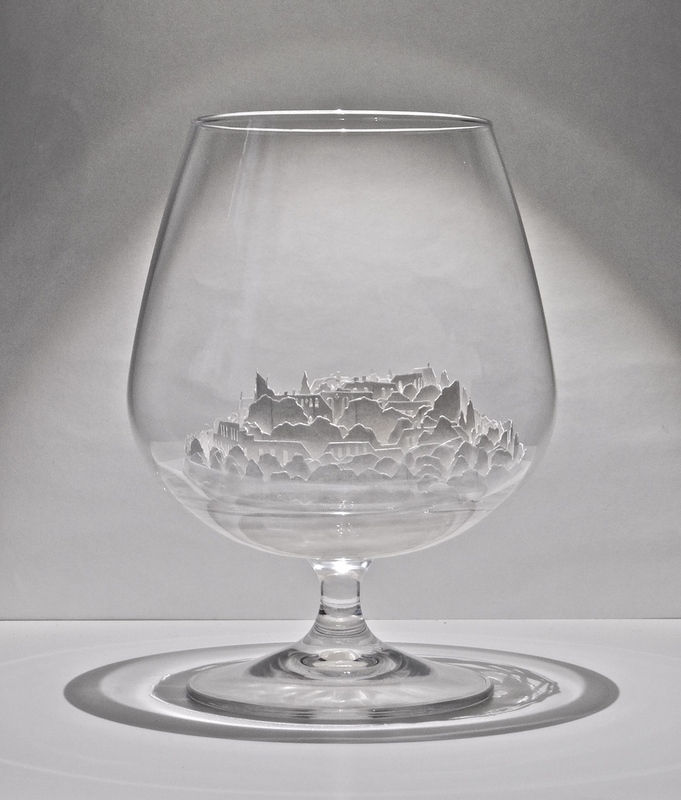 Japanese artist Ayumi Shibata uses traditional methods of Japanese paper cutting to create miniature cities inside of glass vessels. Her chosen materials reference the delicate relationship humans have with our environment and natural forces of our world, while also relating to the Japanese translation of “paper.” In Japanese, the word for “paper” is “Kami,” which can also mean “god,” “divinity,” or “spirit.” Kami are omnipresent in the Shinto religion, and reside in the sky, ground, trees, and rocks. Using this charged material, Shibata attempts to construct a sculptural dialogue about how we relate and respond to our natural world. Some of Shibata’s work is included in the three-person exhibition Passion Paper at Galerie Atalier Du Genie in Paris through March 25, 2017. We have featured many beautiful cityscapes throughout the years, some being grand in scale, and some colorful, while others have been carved into books or even forming paper typography. Well let me introduce you to Jung Senarak, a talented illustrator based out of Bangkok, Thailand who has demonstrated his talents through this beautiful series of miniaturized hand-painted watercolor buildings showing old town Bangkok. He has taken great care to painstakingly add the subtlest details, from patched roofing and small posters, to the smallest type on each storefront. Truly astounding! Surprisingly, I can't believe I haven't had the opportunity to write about the incredible talents of internationally recognized, UK based paper artist Hattie Newman. Her work continues to leave me in shock, due to her incredible attention to detail and likeness she is able to create. 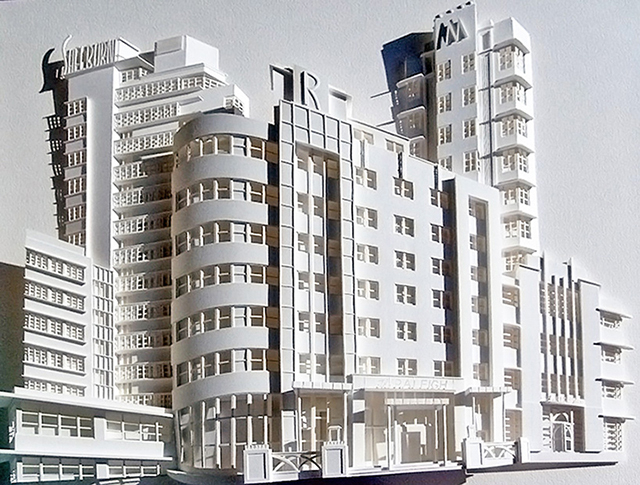 Newman builds large-scale sets, and in this particular instance cityscapes, that are all entirely made of paper. She was commissioned by the agency, Imagination to create a 3m by 3m paper city for Canon’s Expo in Paris, where they decided upon a mixture of iconic buildings and architecture styles from around the world, with The Eiffel Tower being the focal point. I love that paper sculpture, once viewed a little closer, is able to transport the audience to that world, immersing you in the elements found in each particular city. The project took about 6 weeks to complete, where it was then installed onto a bespoke plinth. Wow... just wow! Currently residing in the rural countryside just outside of Bristol in the Mendip Hills, paper artist Sam Pierpoint works both commercially and artistically, for a variety of different purposes ranging from advertising campaigns, magazine covers, editorials, installations, set design, product packaging and window displays. She was recently commissioned by Peloton Design who wanted to collaborate on a Christmas campaign that would cut through the noise for Visit Bristol. They decided upon a paper sculpture of Bristol that would capture some of the cities most loved attractions. This cityscape is moonlit in the night, and created with G.F Smith papers in a muted color palette of white/champagne. LED lights were carefully threaded through the sculpture to create a warm and inviting glow, allowing for the fine details of the structure to almost glisten against the dark backdrop. 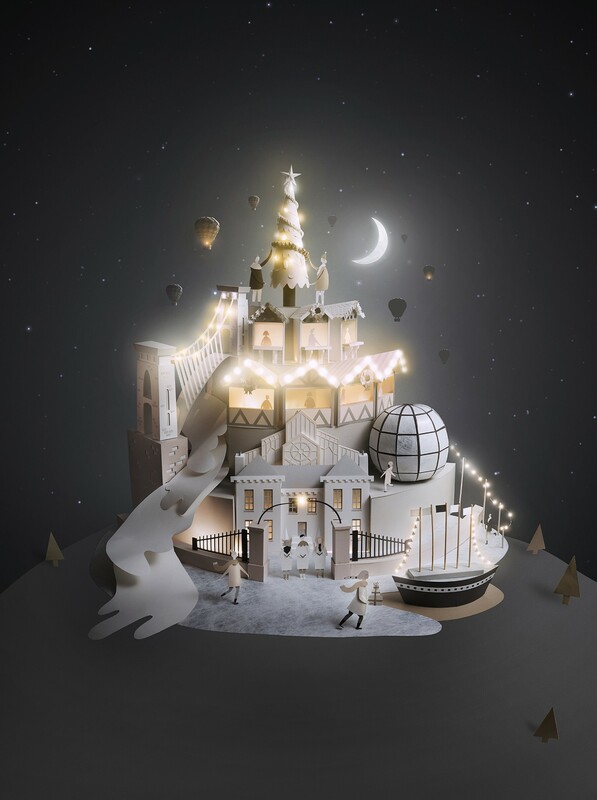 The advertising campaign, which also included an editorial illustration, a publication illustration, window display and a making-of video, featured below, successfully helped to promote Bristol as an exciting and magical Christmas shopping destination for 2016. Dublin based artist Julianna Szabo is the creator of intricately detailed, hand-cut paper sets and illustrations. Her tactile worlds are often three dimensional and sometimes even brought to life with the use of stop motion animation, drawing you in with several visual metaphors. This typographic series was a commission for the annual Silk Road Film Festival, where she was asked to create a poster that represented the event. 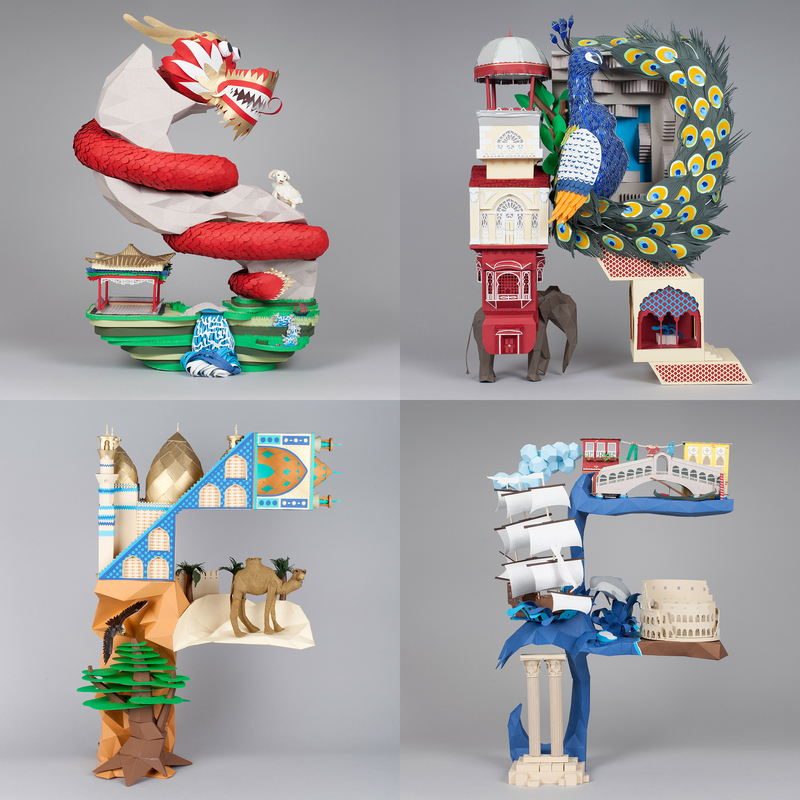 Her inspiration was drawn from the ancient silk road itself, making the 3D hand crafted, paper letters a representation of the journey along that road. The S, in the form of a mountain, represents China and is wrapped with a winding dragon, the R representing India, is stacked with a tall latticed building atop an elephant, the F for the Arabic world, features beautiful golden mosque domes and a camel in the desert, and lastly, the F for Europe, features well known landmarks, like Greek columns, the Roman Amphitheater and the waterways of Venice. Be sure to watch the making of to get a more in depth look into how it all came together. Each letter is so ornately detailed and fashioned with the monuments and architectural structures from these regions, I can only imagine the amount of hours it must have taken to accomplish such a wonderful masterpiece. 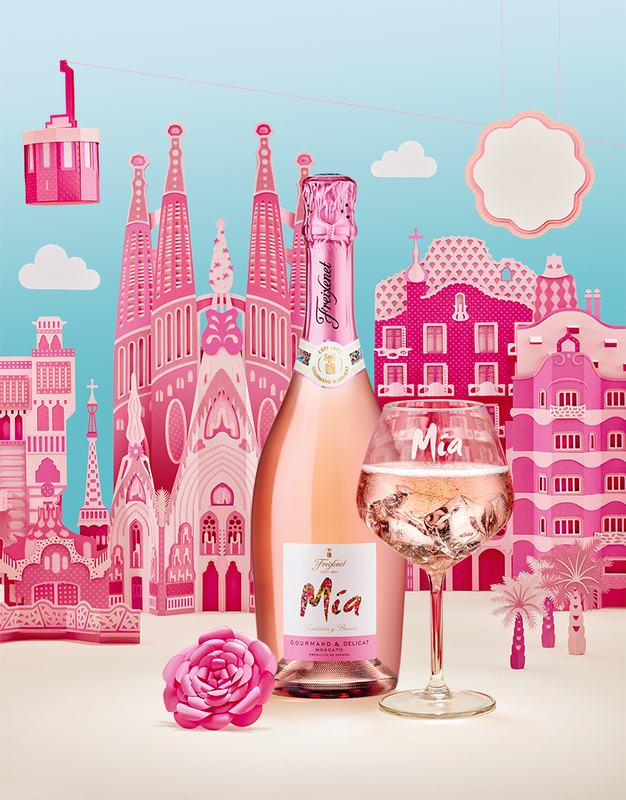 French Studio Zim and Zou have created a colorful campaign for Spanish sparkling wine brand Freixenet, using paper varying shades of pink to create a backdrop of the city of Barcelona. Each building is meticulously crafted to fit into this architectural landscape lined with landmarks from the Catalan capital — including Gaudi’s Sagrada Família, Casa Mila, Parc de la Ciutadella, and buildings in Park Güell. All made by hand, these buildings have been carefully cut, glued and assembled into miniature renditions of the well-known cityscape. 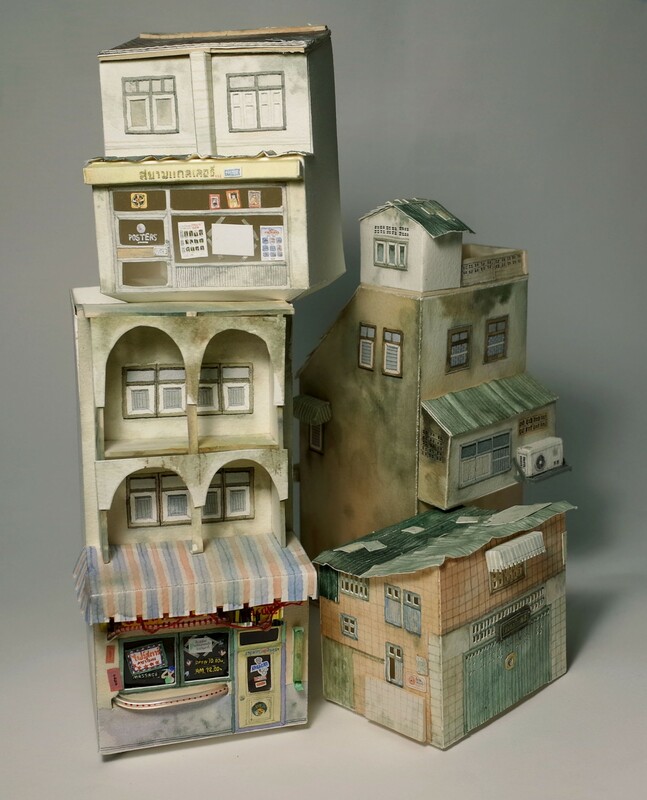 With the use of watercolor paper, PVA glue and a lot of patience, Edinburgh artist Charles Young has built this meticulously handcrafted metropolis he calls 'Paperholm'. Over the past two years, Young has dedicated what I can only imagine to be countless hours to creating more than 600 handmade miniature architectural structures, including urban monuments, vehicles, residences and rollercoasters, each forming an integral part of the final cityscape. We have featured various types of installations of book art throughout the site whether it be colorful or simply the words from a book to form exquisite pieces. 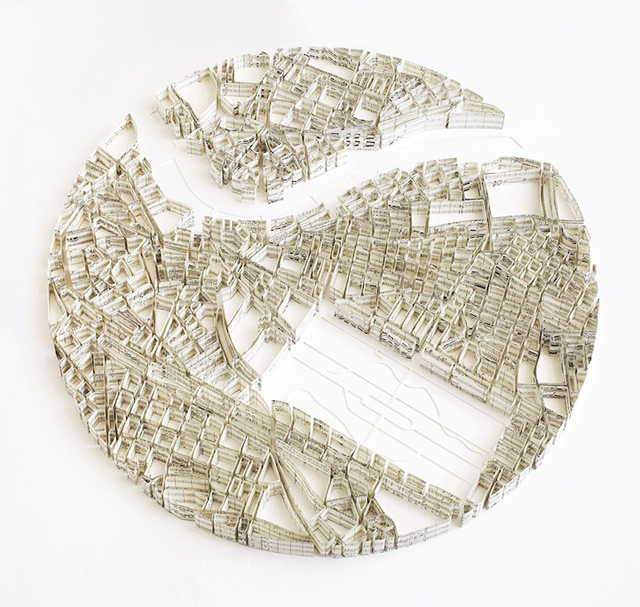 In this series created by Chinese artist Liu Wei, he has taken a large amount of schoolbooks and carved them to depict cities in a state of metamorphosis. Sometimes within the architecture, iconic buildings are shown, from the Pentagon to Saint Peter's Basilica. Christina Lihan, who was formally trained as an architect, has created these astoundingly detailed architectural reliefs by intricately hand cutting paper. 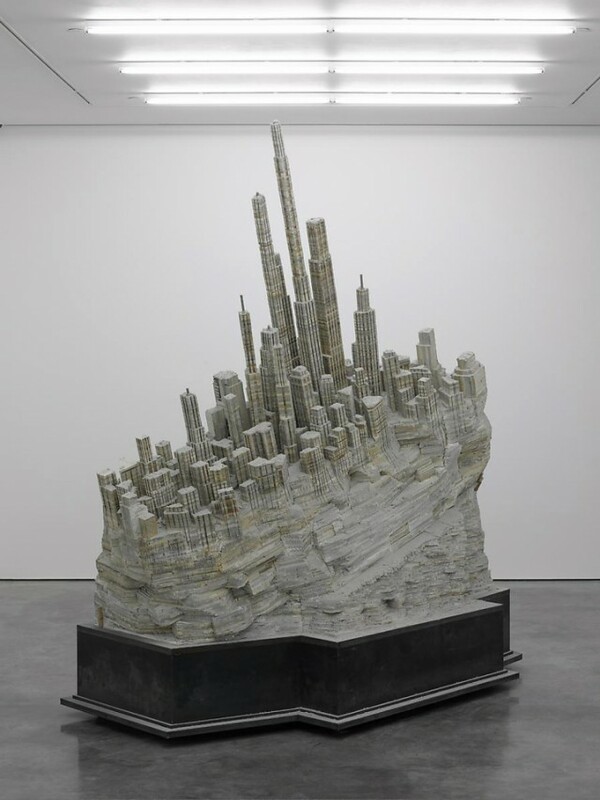 Her works are mostely sculptural, three-dimensional reliefs of skyscrapers, cityscapes, historic buildings, and European and American landmarks. Throughout her process she carves, cuts, scores, bends and folds watercolor paper by hand to form facades that come alive with shadows, texture, light and details. Matthew Picton is a UK-based artist who uses strips of paper from both historic and fictional texts to assemble maps from around the world.